Do you wake up in the morning still feeling tired? Are you drowsy, irritable or have difficulty concentrating? And is your snoring habit a running joke around your household? If you mostly answered yes, you may have obstructive sleep apnea (OSA). This condition is more than an irritation—it could also have major health implications if not addressed. 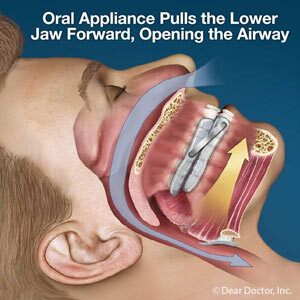 OSA occurs when the airway becomes temporarily blocked during sleep. The tongue (or other mouth structures like tonsils or the uvula) is often the cause as it relaxes and covers the back of the throat. Although you’re asleep, the brain notices the drop in oxygen and initiates arousal to unblock the airway. As this action usually only takes a few seconds, you may not fully awake every time; but because it can occur several times a night, it can rob you of the deep sleep you need for well-being. If you’re diagnosed with OSA, your doctor may recommend continuous positive airway pressure therapy (CPAP). This treatment uses a pump device to supply continuous pressurized air through a hose connected to a face mask worn during sleep. The elevated pressure helps keep the airway open. While this approach is quite effective, many people find wearing the equipment uncomfortable or confining, and may choose not to use it. If that describes you, a qualified dentist may be able to provide you with an alternative called oral appliance therapy (OAT). OAT uses a custom-made plastic oral appliance you wear while you sleep. The most common snaps over the teeth and uses a hinge mechanism to move the lower jaw (and the tongue with it) forward. OAT is recommended for people with mild to moderate OSA, or those with severe symptoms who can’t tolerate CPAP. If you’d like to see if an OAT appliance could help you, contact us for a complete oral examination. Either treatment can improve your sleep and daily lifestyle, as well as help prevent certain health issues in the future. You may think snoring is a minor problem, but it can be a lot more than that. Just ask hoops star Shaquille O'Neal, whose rambunctious snoring bothered his girlfriend enough for her to suspect a health problem. Her observations eventually led to Shaq's diagnosis of moderate Obstructive Sleep Apnea (OSA), which occurs when the soft tissue structures at the back of a person's throat, including the tongue, partially close off the upper airway and prevent air from moving into the lungs during sleep. Sometimes airflow can be blocked completely for 10 or more seconds. When air flow is reduced, blood oxygen levels drop. This leads to brief waking episodes known as “micro-arousals,” which can happen sometimes more than 50 times an hour. The sleeper might not even be aware of this, even while gasping for air. Micro-arousals prevent the person from ever reaching deep, restful sleep. Besides suffering from excessive daytime sleepiness, studies show sleep apnea patients are at higher risks of heart attacks, congestive heart failure, high blood pressure, brain damage and strokes. People with sleep apnea also have a higher incidence of work and driving-related accidents. OSA can be treated in a few different ways. On the advice of his doctor, Shaq opted for a Continuous Positive Airway Pressure (CPAP) machine, which generates pressurized air delivered through a face mask worn while sleeping. The force of the pressurized air opens the airway (windpipe) in the same way as blowing into a balloon does. For people with milder OSA, or who find they can't tolerate wearing a mask during sleep, an oral appliance supplied by a dental professional might be the answer. Oral appliances are worn in the mouth and are designed to gently reposition the jaw and move the tongue forward away from the back of the throat. Success rates of 80% or more have been reported using oral appliances, depending on the severity of the OSA.